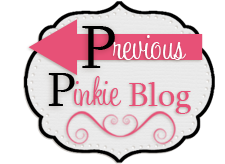 We're so glad you could join us on our blog hop. 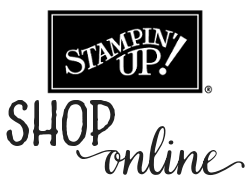 We'll be showcasing lots of gorgeous projects from the new Stampin' Up!® Annual Catalogue. Simply use the buttons at the end of each post to keep on hopping. We love comments, so please do tell us what you think! 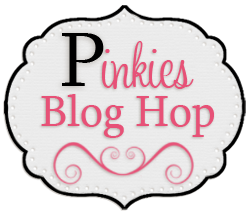 If you have arrived here from Alison's blog, thank you for hopping on to my blog. Weren't her projects with the You're Amazing stamp set, well, amazing!? I've got two cards made with the beautiful Papillon Potpourri set to show you today. I was so disappointed when the butterfly punch retired in September, but for it to be replaced by the Elegant Butterfly punch that matches this stamp set was more than enough compensation. It's so more realistic as a butterfly motif and the patterns in the stamp set are just stunning. 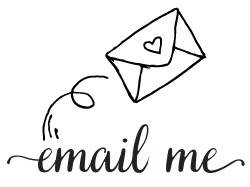 Apologies again for the photo quality – if anyone knows of a good photography and photo editing course, please let me know! 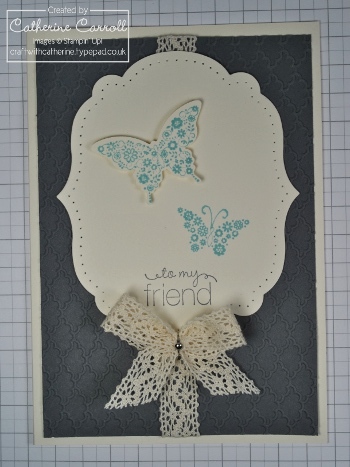 The new Fancy Fan embossing folder creates a lovely, subtle texture as a background. The Victoria crochet trim remains one of my firm favourites, especially in these faux bows. I tried to be sensible ordering from the new catalogue – one thing I am always missing is a decent sentiment. I just seem to have spent my budget before I consider a sentiment set! This one is from Friendly Phrases, and I am sure this set will get me out of many sticky sentiment situations. One of the first things on my shopping list when my copy of the annual catalogue thumped onto my doormat were the doily dies. 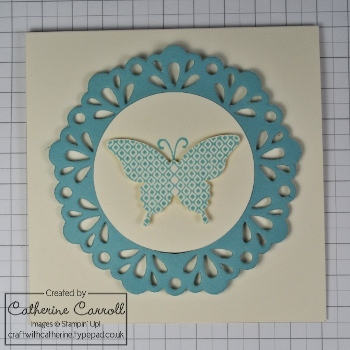 In this little notecard I've used the Delicate Doilies Sizzlits and layered a circle cut using the Circles #2 die in Very Vanilla on top of the Baja Breeze to act as a base for the lovely butterfly. I think I need to set myself a target NOT to use Baja Breeze. I just can't help myself… Maybe a card like this will help – you could make it in any, or dare I say every colour! 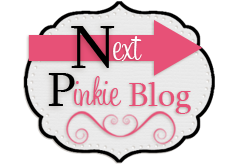 The next stop is Nicky Dexter – I am sure you will love her projects with the Fine Feathers set just as much as I do.